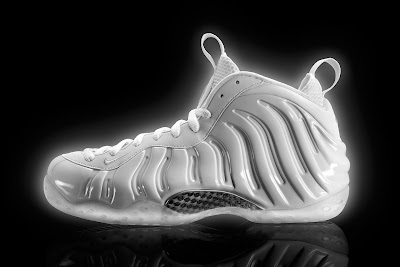 Mr Bru Cru: Foamposite One- White on White. Foamposite One- White on White. One thing about me that you don't know? I don't really like all white sneakers. I walk like a man possessed so I know I'll never keep them clean. Not to mention it eventually yellows to the point of no reparation. I like certain color ways of the Foamposite but this is just not one of them. Nike to me is just dropping any and every color they can and just getting everyone to spend $220 at retail and $500+ plus if you miss the release date. Not my cup of tea. If you want these, they release March 29th. Good luck.